I’ve had the privilege of speaking to groups of women in multiple states and at various gatherings. including being a speaker at MOPS International’s Volunteer Team training in Milwaukee, WI. I love encouraging women and sharing life-changing truths with them. My heart’s desire is that all women would see themselves as God sees them- beautiful, loved and enough in Him. I believe in the importance of community and the strength found in journeying alongside each other (regardless of age and differences.) 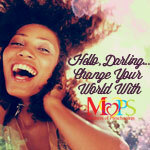 I want to help women find their callings and purpose and equip them to work together to make a difference in a world. A world that needs hope, love and most importantly, Jesus. I would love to come and speak at your MOPS group, women’s events, homeschooling conferences, and leadership training events. I can customize talks to meet the needs of your audience. Most talks run 30-45 minutes in length but the length of time can be decreased or increased depending on your needs. My presentations include humor, real-life stories and examples, hands-on activities, and a variety of visuals and teaching illustrations. Throughout history, women have played a mighty and important role in God’s greater plan. Explore the stories of women who embraced their circumstances, strived to live by their convictions, and held fast to the love and power in Jesus. Be inspired by their stories and learn a few things to apply to your own life’s journey of faith. A talk tackling the question- “Am I enough?” This talk addresses comparisons, setting realistic expectations, the importance of community weaved together with Biblical truths and challenging chargers. EMBRACE THE INTERRUPTIONS AND INTERACTIONS- Embracing people and situations as they come with purpose and intention. We are all fearfully and wonderfully made. As a loving and nurturing parent, it’s our job to encourage our children to embrace their uniqueness, celebrate their individual qualities, and train up our children in the way they should go (Proverbs 22:6). Culture and others try to label and define us with images that are not from God. Let’s rediscover who we are, with all our strengths and limitations, and learn to take root in our identity in Christ. We’ll learn more about our personality and ways to love and connect with our children to help them to FLOURISH in who God created them to be. (personality types, love languages) This is a workshop style “talk” with personal personality inventories worked through and discussion time woven in. Are you tired, overburdened, and over committed? How do you keep it all together? Do you have an empty bucket? With the constant demands and choices, how do we know what the best choices are? Learn to look at your schedule with new eyes, embrace rest, and celebrate simplicity.